Take your career to the next level with a specialized program in business analytics. 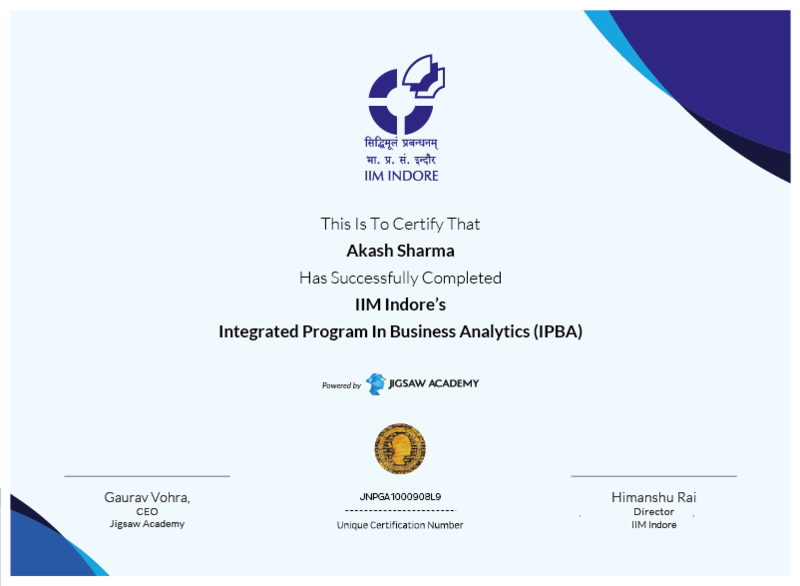 The Integrated Program in Business Analytics (IPBA) is an IIM Indore program, and blends traditional management principles with cutting-edge technology coverage. It includes a comprehensive education in data science, business analytics, visualization, Big Data and machine learning. With a constant demand and an ever-increasing focus on developing new insights and understanding of business performance based on the data and statistical analysis, IIM, Indore is all set to launch a 10-month Integrated Program in Business Analytics (IPBA) in collaboration with Jigsaw Academy. In a first of its kind initiative, this learning partnership will bring to working professionals an unparalleled flexible learning experience. It has been carefully designed with extensive live online classes and comprehensively covers Data Science, Statistical Modeling, Business Analytics, Visualization, Big Data and Machine Learning. For working professionals who are interested in building careers in data science with a strong background and context in business, the IPBA will equip you with a fundamental understanding of both. They will also get a great opportunity to learn from award-winning faculty from IIM Indore and Jigsaw Academy, interact with business leaders and benefit from the IIM network and work with the complex data sets using Python & R. It includes an in-person component of classroom teaching at the IIM Indore campus. The program includes hands-on learning with industry projects and real-world networking with business leaders. Enrolment for this program can be from anywhere in India or the world since classes will be primarily online. This program will be directed by IIM Indore in collaboration with Jigsaw Academy, India’s top ranked institute for analytics and data science. For professionals who are interested in building careers in data science with a strong background and context in business, the IPBA will equip you with a fundamental understanding of both. The program comprises of 120 hours of training via live online classes, online assignment-solving and Q&A sessions that can be accessed from anywhere in India or the world. There is also a separate in-person ‘immersion’ component of 30+ hours of classes, networking and project presentations that will be held at the IIM Indore campus. Would you like to know more? Download the IPBA Brochure. Established in 1996, Indian Institute of Management Indore has been a leader in the field of management education, interfacing with the industry, government and PSUs. It is promoted and nurtured by the Ministry of Human Resource Development, Government of India and is an institute of national importance under the Indian Institutes of Management Act 2017. 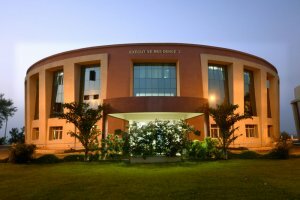 IIM Indore seeks to be a contextually-relevant business school with world-class academic standards that develops socially-conscious managers, leaders and entrepreneurs. In recent times, IIM Indore has bagged the Fifth Rank (5th Rank) in the National Institute Ranking Framework (NIRF) announced by the Ministry of Human Resource Development (MHRD), Government of India on April 08, 2019. The IPBA curriculum is designed to be a comprehensive program covering technical and business aspects of the application of analytics and data science. It starts by laying a strong foundation of essential tools and techniques including descriptive and inferential statistics, data extraction and manipulation with SQL, data manipulation and processing with Python & R, and data visualization with Tableau. The bulk of the program builds on this foundation by extending the analysis capabilities to predictive models using statistical modelling and machine learning, and covering data types that are both traditional and structured, to more unstructured types including text and images. All IPBA students will be mandatorily required to complete an industry project that will feature actual real-life business problems. They will have to liaison with an industry representative and work with a faculty-in-charge and present their findings based on the requirement from the company. The culmination of the industry project will be class project presentations that will be evaluated and the scores will be taken into account before the final certification. The data science and analytics industry is one of the most fastest growing, estimated at $2.71 billion in annual revenues. And the outlook is also positive, with an impressive growth rate of 33.5% CAGR. Today, it is estimated a whopping 50,000 machine learning and data science jobs are unfilled and there are yet around 39,000 new analytics jobs that will open up just in India by 2020. For more details about analytics industry, download our analytics industry report. As an IIM Indore program, students will be encouraged to elect and form a placement committee from amongst themselves. The placement committee is involved in facilitating placements. It does so by assisting recruiters to make appropriate hiring decisions and at the same time supporting the participants to make strategic career decisions. Students will be free to circulate relevant profiles amongst companies in IIM Indore’s and Jigsaw Academy’s networks of companies using their IIM Indore student credentials. Note: For students with more than 5+ years of experience, it will be more relevant to identify opportunities that leverage their past domain experience and look at transitioning into a full-time data science profile over a longer period of time. IIM Indore students currently work at some of India’s largest companies and start-ups. Here is a sample list of recruiters. A telephone interview will follow once an application has been deemed successful. All candidates will be evaluated on an individual basis and only selected candidates will be emailed the offer letter. Admissions and interviews are being conducted on a rolling basis. THE LAST DATE FOR APPLICATION IS JUNE 30TH 2019. After the interviews are conducted, all the selected candidates will be sent provisional admission offers which can only be deemed accepted by the candidate if the institute receives an acceptance letter along with a payment of commitment fee of INR 50,000/- (Rupees Fifty Thousand only) plus Applicable Tax within the stipulated time period mentioned in the offer letter. THE LAST DATE FOR ADMISSION IS JULY 20TH 2019. A valid GMAT / CAT / GRE / Jigsaw Administered Test score. The score should be within 05 years on the date of submission of application. For example, a candidate submitting application on 10 October 2018, should have taken the GMAT test between 11 October 2013 to 10 October 2018. Minimum 1+ years of work experience. What is the eligibility for the IPBA? A valid GMAT / CAT / Jigsaw Administered Test score. The score should be within 05 years on the date of submission of application. For example, a candidate submitting application on 10 October 2018, should have taken the GMAT test between 11 October 2013 to 10 October 2018. Please look at the Admissions section on this page for details. The application fees and payments are non-refundable. In case of extenuating circumstances, a transfer to the next batch is possible however a batch change fee will be applicable. This transfer will be approved in genuine cases only. Please look at the Placements section on this page for details. Yes, we have tie-ups with established financial institutions in case students wish to opt for an education loan to finance the program fees. However the loan disbursal and offers are from our loan partners and are dependent on your credit rating and details. Please contact us for details. Yes, IIM Indore and Jigsaw Academy will have knowledge and corporate partners who will play an active role in the exposition of the curriculum, learning interventions and in networking. Yes, you need your own laptop. The technology requirement shall be shared at the time of enrolment. The certificate is awarded by IIM Indore. Is this a diploma or a degree program? Except for the PGP-MX, all of IIM Indore’s executive offerings are certification programs. 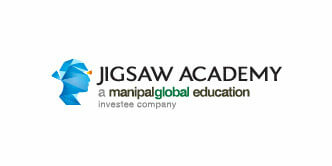 IPBA is a certification program in business analytics from IIM Indore in collaboration with Jigsaw Academy. Students would be awarded a certificate from IIM Indore after the successful completion of the program. Moreover, all IPBA students would get a lifetime alumni access to IIM Indore alumni network. Would IIM Indore faculty be teaching this course? Yes, part of the online classes and the in-person sessions would be taught by IIM Indore faculty. Would the online video content be available to me after completion of the course? The learning material i.e. lectures and reading content would be available to you for 12 months after the course ends (in addition to the course duration which is 10-11 months). We accept corporate sponsorships and can assist you with the process. Please contact us for details. What types of industry projects do students work on? The students work on industry projects involving real-life data used by companies. The projects test the students in analytics, Big Data and techniques including machine learning and predictive analytics. Students teams will have a faculty mentor who will guide them through the project and a contact within the company who will provide the business context. Students will be encouraged to explore and solve the problem in the same way they would when in a live business situation. To be eligible for certification, students will need to pass all module-level asssessments with a minimum 50% score, and additionally a 50% score in the project. The assessment process will include vivas. Are the in-person sessions mandatory? No, they are not compulsory, but we advise students to attend for an opportunity to meet the faculty, network with industry representatives and their peers and for a more holistic appreciation of the course. For any queries regarding admissions, or to establish industry or academia relationships, or additional assistance, reach out to us at ipba@iimidr.ac.in or +91 9019217000. To apply for the Integrated Program in Business Analytics (IPBA) program, you will need to provide the following necessary details & documents (in digital format for upload). Please ensure you have all the documents before you attempt to fill in the application form. *If you do not have a GMAT / CAT / GRE score, please enter N/A and you do not need to upload any proof of score. Our Admissions team will reach out to you after you complete the application process to schedule your Jigsaw Admission Test. You will be charged a non-refundable application fee of INR 1000 / USD 20 upon submitting your application. You can pay by using credit/debit card or by using netbanking. Please click 'Submit' to proceed to payment.